I had an hour spare this afternoon so I made the short journey south to Clevedon to see the 2 pale-bellied Brent Geese on the Blackstone Rocks. I was surpised to find them with 5 dark-bellied Brent Geese. At the moment they are only considered different sub species but the pale-bellied form is a rarity in this part of the world. I apologise for the poor quality picture but they only showed at distance on the choppy water, the pale-bellied birds are the second and third from the right. 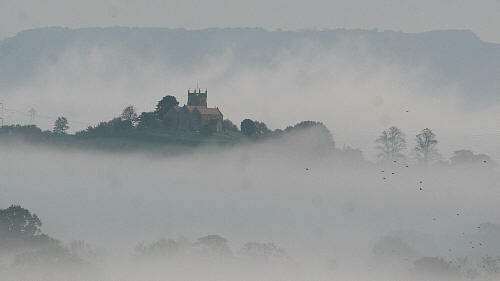 A morning of dense fog. I went to the nearest high ground on Aust Cliff. There was a spectacular panoramic view here with only the top of the Severn Bridge, the tower of Oldbury Power Station and a hill top church being the few things on view. A small numbers of migrants were seen flying South including the surprise bird, a Hawfinch. When the fog cleared a Short-eared Owl gave excellent views again at Aust Warth. Another day when I wished I did not have to work when the 8th and 9th missed species for the month; 4 Woodlarks over the Axe estuary, another over Clevedon and a Richard’s Pipit over Sand Point. Another species was found today that I was unable to see; a Lapland Bunting on the Axe estuary. This was the 7th missed species this month joining some late reported sightings of Lesser Spotted Woodpecker at Chew Valley Lake and an immature Shag at Sea Mills harbour in Bristol. Perhaps there is still time this year to catch up with some of these rarities but with the limited daylight in the evenings I am going to have some busy weekends. I had some luck today; not only had I chosen to take today as a day off, but I received a call from the “Weston Birders” to say that a rarity had been found once again at Sand Point. Within 40 minutes I was stood in the car park with 3 happy chaps who had already seen the bird. Fortunately after 10 minutes, it’s characteristic call from the tree canopy was heard and soon I was looking at my first Avon Yellow-browed Warbler for three years. 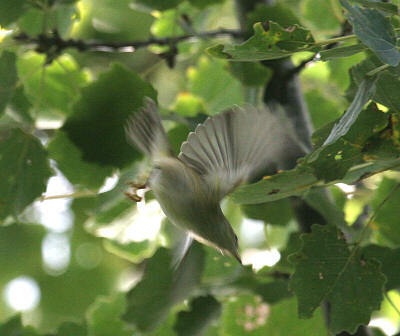 The bird continued to give brief glimpses and neck breaking views as it moved around with some Goldcrests. It fed high in the canopy, often hovering below leaves. 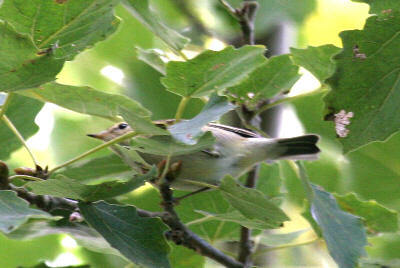 I managed to get a few record shots plus many pictures of parts of the bird and many green leaves. A superb bird to beat my previous record total with. 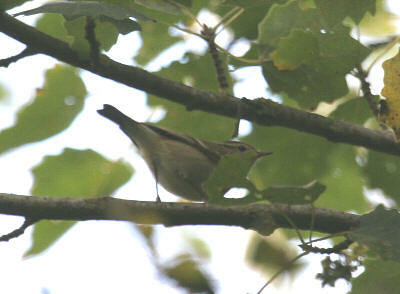 Other birds seen in the brief visit to this migration hot spot were 2 Merlins, a Brambling, Redpolls and a Chiffchaff. After a night of strong South West winds it was disappointing to get up early this morning to find that the wind had dropped. I decided to have a look off the sea wall at Severn Beach anyway as the tide was nearly in. Within a few moments of scanning the “burger bar bay” with another a birder, we saw a small black and white bird flying low and fast over the water at 100 yards range, it took a few seconds to realise it was a Little Auk. It then landed on the river and was watched until it quickly disappeared in the waves. A morning of quality rather than quantity as no other seabirds were seen. I did receive a call at 10 am to say that a male Hen Harrier was seen flying up the estuary from Clevedon but it has not been seen here yet. I spent the afternoon at Blagdon and Chew Valley Lakes today hoping to see the 13 Bean Geese that had reappeared at Blagdon yesterday afternoon. They didn’t show today but I saw plenty of other birds including a large flock of 140 Golden Plover and a Yellow-legged Gull at Blagdon, another Yellow-legged Gull and an adult Mediterranean Gull at Chew. The day got worse when I received a call at Chew about an adult and juvenile Sandwich Terns at Oldbury Power Station when I was an hours drive away with only 40 minutes of daylight left. I went on a wild goose chase this afternoon when 13 Bean Geese were found at Blagdon Lake. Unfortunately they departed high and west 30 minutes before I got there. Had I been luckier, these would have been the first Bean Geese I had seen at Blagdon since February 1990 when there were 10 birds presenet. No new birds for my year but an adult Kumlien’s Gull was found at Barrow Gurney Reservoirs yesterday and a ring tail Hen Harrier was seen at Weston Sewage Works today. I was hoping to see both of these species earlier in the year so it seems I may still have a chance with over 2 months until the end of the year. A grey morning with thousands of Chaffinches heading into the North East wind all day but I didn’t manage to hear or see my first Brambling or Redwing of the autumn. 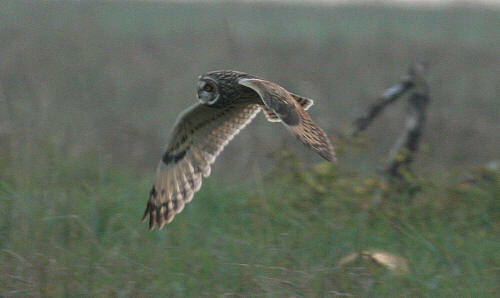 A Short-eared Owl was found yesterday on Aust Warth and it showed again today at dusk. It attracted the attention of a pair of local Kestrels and was mobbed while hunting for voles. Friday the 13th was a lucky day for me. The wind had swung around to a North East direction, always good for interesting birds at this time of the year. I had received a call late morning about a Spotted Redshank at New Passage so by lunchtime I was standing on Northwick Warth searching the Redshank flock. Within 30 minutes I had seen the bird but the whole flock flew off to roost out of view. A dark-bellied Brent Goose was another new arrival with a small influx of 90 Wigeon. I waited for an hour for the Spotted Redshank to move back to the pill at New Passage in the hope of taking a picture. A fisherman in a yellow high visibility jacket decided it was also a good place to drown a few worms so I will have to take a picture another day. There was a steady passage of migrants overhead including Wagtails, Skylarks, Chaffinches, Meadow Pipits and a Redpoll. I spent another morning back on Axe estuary. This time the attraction was a Wood Sandpiper. 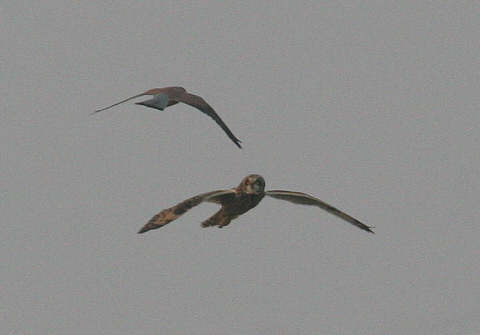 Both birds could be seen from the Avon side next to each other giving the unique opportunity to compare size and leg length. 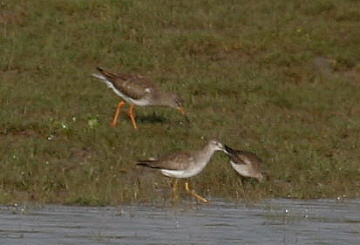 The Yellowlegs towered above the Sandpiper on stilt like legs. The Wood Sandpiper was seen to fly several times over the large Redshank flock and disappeared late morning, calling very near to us, on the Avon side. Other birds of note here were a Greenshank and a Common Sandpiper. Late in the afternoon I received a call to say that a Spotted Redshank had also been found so I will be going back if it remains in the area. I received a call this morning about a Lesser Yellowlegs just over the Avon border on the Somerset bank of the River Axe near Weston sewage works. Soon after I arrived some Somerset birders were watching only the Yellowlegs on the Avon side of the Axe but out of view from us. After approaching the river bank slowly, I saw the bird briefly with some Redshank before it flew up the narrow river and out of view. Eventually the bird showed well but distantly from the Brean Cross Sluice, always on the Avon Bank. This was only the 3rd Avon record of Lesser Yellowlegs and my second following one I saw at Avonmouth Sewage works back in the autumn of 1984. A late afternoon sea watch back at Severn Beach proved productive when I found a Grey Phalarope floating 50 yards out from the sea wall, but rapidly drifting up river on the rising tide. I kept pace with the bird with the bird as it floated towards towards the Severn Crossing but eventually lost sight of it after a few minutes. A disappointing day with ideal conditions for Leach’s Petrels all I managed to see were a couple of late Manx Shearwaters and a distant Fulmar. An afternoon of strong south west wind and an early evening tide was likely to produce some seabirds. While sea watching from home I saw 2 Great Skuas glide into the burger bar bay near the Second Severn Crossing. The forecast is for some severe winds tomorrow so I could see more sea birds, hopefully Leach’s Petrels, in a quick search before work in the morning. I stayed on Severnside again today and found a nice group of 6 juvenile Curlew Sandpipers feeding on the shore above the Severn Tunnel. 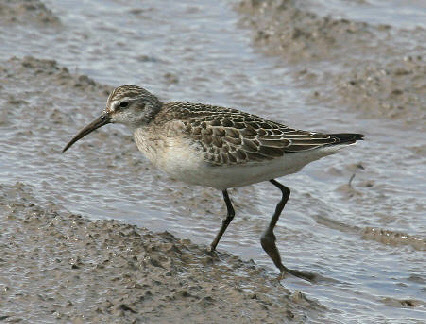 Another Pectoral Sandpiper was found in Avon today at Blagdon Lake. Having already seen 3 others in recent weeks I won’t be making the trip south unless the Red-necked Phalarope found in Somerset today decides to move a few miles north.